There is more than one way to dress up a window. Because they are often ready made and easily hung, sure most people think of drapes and curtains. What they might not realize is that interior shutters are a beautiful, traditional window treatment that can be used with or without other types of window dressings. With interior shutters you have a little bit of both– function and frill. Shutters will block out light, even act as an insulator for the window, but they are also quite decorative. 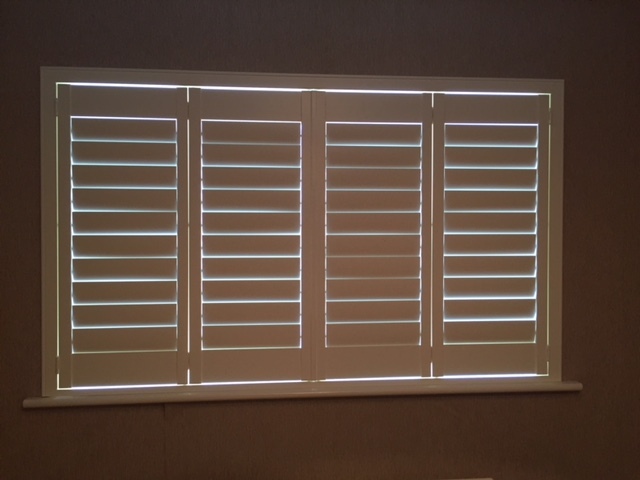 Interior shutters differ in purpose from exterior shutters. Originally shutters were used to protect a home’s windows from the wind of a hurricane or cold of a winter storm. Now most exterior shutters are purely decorative in nature. There are window coverings and window dressings or treatments. To the untrained in decorating (which may account for most husbands) a shade or blind that blocks out light and provides privacy may seem like a complete window treatment. Then you can install your own interior shutters, if you can master home improvement projects of average difficulty. This is a DYI project that can be completed in very little time and with basic tools. You can pre-prime and paint shutters before installing them. Vinyl shutters never need painting, but a good cleaning with warm, soapy water from time to time in order to removed build up dust or dirt. Interior shutters add a warm, traditional feel to any home. Large slated shutters, often called Plantation Shutters, get their name from the old southern plantations. Shutters will block out light, even act as an insulator for the window, but they are also quite decorative. Interior shutters differ in purpose from exterior shutters. Originally shutters were used to protect a home’s windows from the wind of a hurricane or cold of a winter storm. If you are doing an interior mount– that is on the inside of a window box, then you are all set with secure 2×4 studs to securely hold shutter screws.